Ну очень простенький дизайн,сразу видно затрат нет.Я точно мимо такого. Особенно когда вижу знакомые лица.Сразу понятно Админко раздает своим. Freedomind	+5.00	Received Payment 5.00 USD from account U16264529. Memo: API Payment. Invoice 2072, ExclusiveProfit. Freedomind	+4.00	Received Payment 4.00 USD from account U16264529. Memo: API Payment. Invoice 2070, ExclusiveProfit. 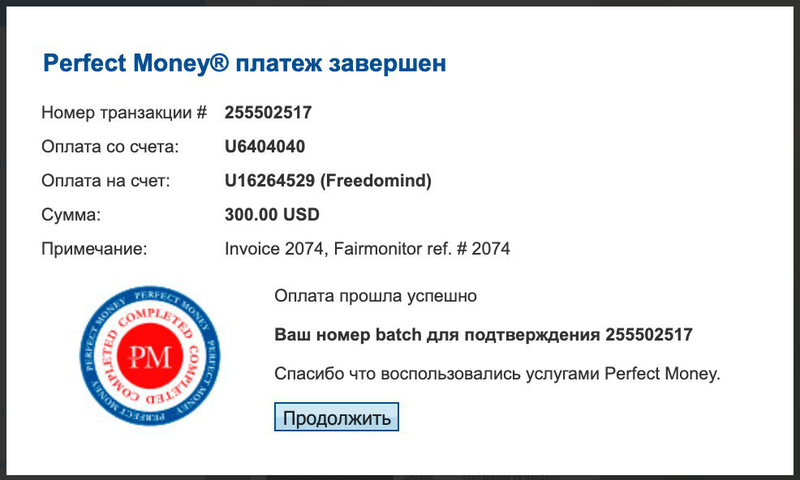 Freedomind	+1.33	Received Payment 1.33 USD from account U16264529. Memo: API Payment. Invoice 2269, Fairmonitor. Да как то сомнительно, что он за небольшой срок успел такой траст набрать, особенно с учетом того, что по ISP вкладов нет. А что спрашивать,ответ то известен. Freedomind	+9.00	Received Payment 9.00 USD from account U16264529. Memo: API Payment. Invoice 2398, ExclusiveProfit. The amount of 2.52 USD has been deposited to your account. Accounts: U16264529. Memo: API Payment. Invoice 2385, Nik888.. Date: 15:17 13.04.19. Batch: 255665323. The amount of 2.52 USD has been deposited to your account. Accounts: U16264529->U39*****. Memo: API Payment. Invoice 2390, yura8943.. Date: 15:25 13.04.19. Batch: 255666318. The amount of 2.7 USD has been deposited to your account. Accounts: U16264529->U14ххMemo: API Payment. Invoice 2448, .. Date: 19:03 13.04.19. Batch: 255690467. HYIP VISION МОНИТОР с высоким рефбеком. Рекомендую!